Project Description: Spread some holiday joy with custom greeting cards made with Grafix Shrink Film. 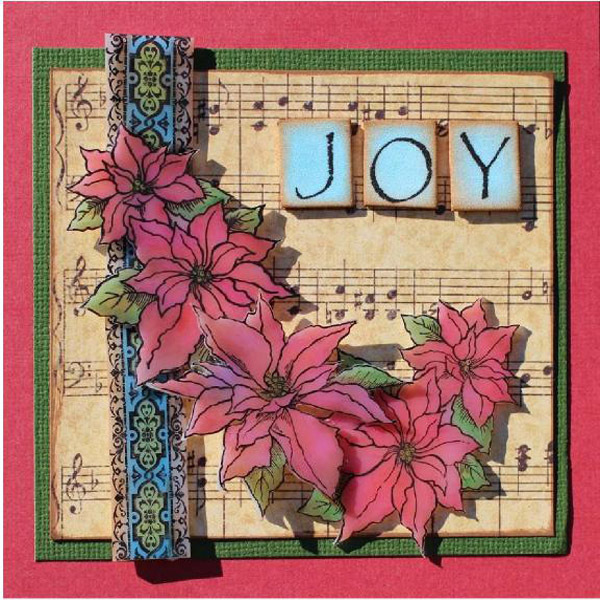 Stamp 2 double poinsettias, 1 single poinsettia and 2 border strips on Matte Shrink Film using Black Surfacez Ink. Color and shade pieces using colored pencils as follows: poinsettia petals: 2 shades of red, poinsettia leaves: 2 shades of green, poinsettia centers: yellow, border strips center and edges: yellow, border strips accent: aqua. Once pieces are filled in, lightly blend colors using paper towels. Colors will appear light, but will darken when pieces are baked and shrunk. Bake pieces according to package directions. Print “J”, “O”, and “Y” on White Inkjet Shrink Film using a word processing program, leaving spacing between each letter. Font and size used in sample: Papryus: 90. Cut out letters and fill in with a crosshatch pattern using aqua pencil; blend with paper towel and bake according to package directions. Lightly distress the edges of all Shrink Film pieces using Chestnut Roan Chalk Ink applied using Stylus & Tips. Make card from 5 X 10 piece of kraft card stock. Cut a 4 7/8 square of red card stock and mat on card front. Cut a 4 X 3 3/4 piece of printed paper and lightly distress edges using Chestnut Roan Chalk Ink applied using Stylus & Tips. Mat printed paper piece on a 4 1/4 X 4 piece of green card stock. Then adhere pieces, centering on card front. Arrange and adhere Shrink Film pieces as shown in finished card.